Any change we could get a blacklist on the grated hopper or another hopper type to handle blacklisting? I like this idea; I second this request. @FyberOptic, it looks like there is a bug in the current version that is stopping grated hoppers from pulling items from anything (standard hoppers, other grated hoppers, or ducts) if it is possible for the item to move laterally. I'm using the following testing for framework. For example, if I place place cobblestone on the left duct - which is included in the grated hopper filter rule directly over the chest it will still continue down the line and eventually stop on the top row, on the right. 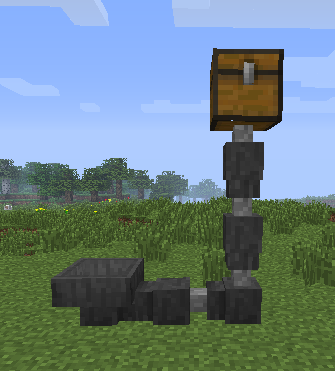 Using standard hoppers these would fill the chest, the hopper directly above it, and then overflow to the position on the right. It feels like a timing issue; as far as I can tell the grated hopper isn't reading for an item to pull in before the move is executed on the block above. I don't think it's even supported, even though a reliable two-way-filter would be a nice addition. Also I don't like the non-accepting behaviour of hoppers. Maybe we can have a kind of hopper that will never stop accepting items and always deliver while it's active? I'm not sure about the exact mechanics yet. go inert (chest-like) while powered, don't block accepting. 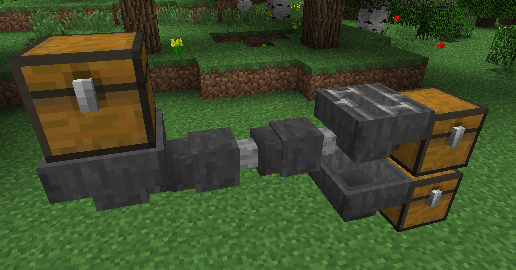 Grated golden hoppers will stop filtering, too (so you can make an item stream switch; the filtered items go into the output (at the side) only as long as the golden hopper is unpowered, and if it gets powered, they will go from the powered into the generic hopper below only. Beware, a directly powered block will power neighboring blocks, too). 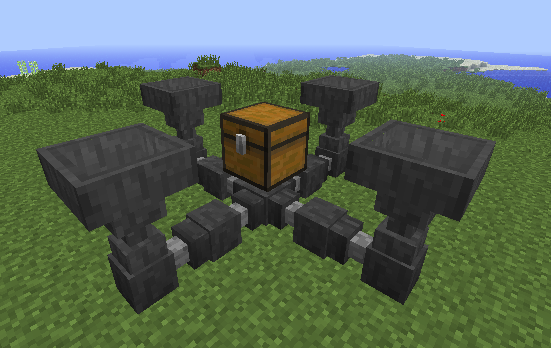 [C] Standard chest with redstone ore collecting. If each GH is filtering a different ore then the only one that ever works is the first one and the catch all at the end is never used. could you add another feature to the ducts, like if you craft them with a gate per say and then by doing that, you limit their inventory slot from a full stack to 1 item of a stack. Ie, I need hopper ducts that only transport 1 item at a time.